Ever felt as though your brush has more hair than your scalp does? It can be disheartening to deal with hair loss, and see your tresses thinning over time. There might be a gazillion products out there that promise to restore your locks to their former glory, but do they really live up to their claims? If you are seeking a surefire way to achieve hair growth, there is one ingredient that has lain unconsidered and overlooked – the humble onion. Inexpensive and readily available, onions can be the end to all of your hair woes. To know the why and how, read on! Caution: Those who are allergic to onions, even its topical application can bring about a reaction. Also, certain medications such as aspirin can increase sensitivity to onions. A patch test is necessary before using onion for hair treatment. Why Is Onion Effective In Facilitating Hair Growth? Onion has a high concentration of sulfur that helps with numerous hair conditions that cause hair to fall out. But first, it is necessary to understand the structure of your hair and the causes of hair fall in order to understand why onion is an effective remedy. Hair is made up of proteins, out of which keratin gives hair its strength. This is because of the abundance of sulfur present in it. It is the chemical bonds that sulfur forms that determine the texture of your hair, as well as its health. In fact, hair loss has been linked to the absence of high sulfur proteins. Methylsulfonylmethane is a highly absorbable source of sulfur, which is found in onions. It helps with the formation of keratin in hair, which results in hair growth. Recent research has shown that the topical application of onion juice can help with alopecia areata. Alopecia areata is an auto-immune disease where the body attacks the hair follicles, and these result in spot baldness. Onion juice helps with the re-growth of hair in the spots where the hair has fallen out. Using onion for your hair can drastically reduce hair fall and help promote hair growth. There are several ways it can be incorporated into your hair care regimen. Caution: Onion has a strong odor. To remove it, rinse your hair with lemon added to warm water. Wash the onion thoroughly and peel off the outer layers. Chop the onion into smaller pieces and toss into a blender. If you are using a grater, use the finest side to grate the onion. Using a juicer is the easiest way for preparing onion juice at home. Place the pulp in a strainer and squeeze out as much juice as possible. Massage the juice into your hair, concentrating on the roots and the scalp. Keep it on for 30-45 minutes and wash with shampoo. This treatment should be used once or twice a week. Add the onion juice to the warm water. Use the mixture as the final rinse after you shampoo. This onion paste for hair can be used every alternative day. Caution: The odor of onion will be retained in your hair until the next time it is shampooed. Add the essential oil to the concoction. This step is optional, but essential oils help mask the strong odor of the onion. Massage the mixture into the scalp and keep for 1 to 2 hours. Rinse the pack off using shampoo and warm water. This mask should not be used more than once a week. Place the chopped onions and the rum in a glass jar, and let it sit overnight. Strain the mixture and apply it to your scalp. Caution: The rum can dry out your hair. Therefore, don’t apply this potion more than once a week. 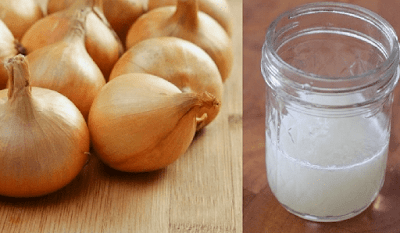 Onion juice for hair growth, onion and honey mixture is the best way you can have raw onion orally. You need to take 2 tablespoons of raw onion juice and add a tablespoon of honey to it. You can either intake the juice directly, or can apply the mixture to the scalp as well. Mix the onion juice with the honey. Apply to hair and keep it on for 15 minutes. Shampoo thoroughly to get rid of all traces of the pack. How Often Should You Use Onion Juice. Chop the onion into smaller pieces and blend using a blender. Alternatively, you may use the pulp leftover from making onion juice. Add the beer and the olive oil to the pulp to make a paste. Apply to the hair and keep in on for 1 to 2 hours. This pack should be used once a week. Oral consumption of onion can be equally benefitting for the hair. Onions are excellent taste enhancers and can make any food taste nice and rich. Hence, if you cannot stand its overpowering smell, you can try adding onions into your regular recipes. This will offer you the same benefit as applying raw onion on the scalp. This onion juice for hair growth pack should be used once a week. Onions are great for preventing hair loss. Raw onion should be applied directly on the scalp to foster new hair growth. The onion juice is excellent to stimulate blood circulation and expedite hair growth. Onion helps prevent premature graying of hair. You can either eat it orally or apply onion extract on the scalp. Onion, with its rich sulfur content, is an excellent tonic for hair thinning. Regular application of onion helps thicken hair by improving its volume. Onion is a natural cure to treat hereditary hair loss and premature hair greying. Onion for hair fall, Several researches conducted on hair fall have established that onions contain great healing properties. These are effective in treating conditions such as androgenic alopecia or female pattern baldness. Onion on hair, The antibacterial properties of onion aid in treating several scalp and hair infections caused by fungi and yeast. So are you ready to use onions for hair growth? When it comes to remedies for hair, onions are an oft neglected ingredient. So give onions the attention they deserve and bid adieu to hair loss!